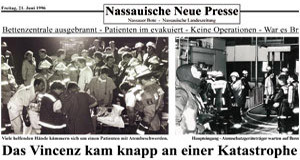 June 21, 1996, Friday morning 0:50 o'clock: I wake up by the pager saying „fire alarm at St. Vincenz General Hospital“. Hearing further alarms on the way to the fire station, I realize that this is a large scale operation. I am part of the initial fire attack crew wearing breathing protection. Three weeks ago, our fire brigade received the first HuPF suits: one jacket and one trouser per breathing protection device. So there was no personal assignment and no personal equipment in the bags of the suits. Without hose line - we have to control a part of the building that has already been evacuated by the medical personnel. Before entering the building, we try to fix our 30 m safety rope. This turns out to be difficult because the rope is still originally wrapped in the rope bag. Although it is easy to rip off the plastic foil, we are not able to open the strings, which are tied around the rope, with bare hands. So we have to pull the rope a few meters out of the bag before we can open the strings. I remember the incident with the rope bag and have the idea of attaching a knife to the firefighter belt or the respiratory protection device, easily accessible. October 1997, the multi-pocket double bag is born! Under the name „Hergenhahn Feuerwehr-Zubehör“ I start the production and distribution. Basing on the multi-pocket double bag, other pouches have been designed over the last years. Many of them with the help of our customers. Today, Today we offer a broad range of bags and pouches for firefighting and rescue operations. and later in a rented building with office and storage in Runkel/Dehrn. Finally! – At the beginning of 2004, we move to our own company building in Runkel-Ennerich. 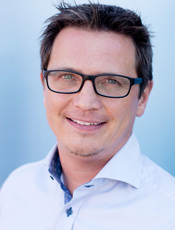 With a stock of 400 m², more than 2000 articles. 2007 we celebrated 10 years rescue-tec. That means also 10 years of experience in holsters and bags production and development. Meanwhile a range of bags and pouches especially for firefighting operations exits. Well-known customers from all over Europe trust in rescue-tec know-how and ask for individual and customized solutions. We test and optimize our products regularly, so that they are always up to date and compatible to the respective equipment. In contrast to the poor economic situation (financial crisis), 2009 was a very successful business year for rescue-tec. However, success has a price - the company building has become too small once again. Luckily, we had the opportunity to purchase the neighbour company building and could thus increase our space from 400 m² to 800 m². rescue-tec is the supplier with bags and holster in accordance to the DIN 14922. They are made of sturdy, flame-resistant material and with an emergency release device against unintended getting caught. The bags are certified safety for your operation! As our buildings got to small again, the shipping department was enlarged in August 2012. This was only a preliminary stage for the rescue-tec store. Here you find a large product range, e.g. HAIX-boots, apparel, fire fighting products, first aid material and original presents. Come have a look! 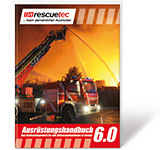 In March 2014 the rescue-tec equipment catalogue was released. With 420 pages it is more extensive than its predecessors. (only available in German). In June 2015 the Interschutz in Hannover (Germany) took place. 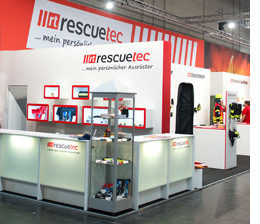 rescue-tec was there with 11 employees and a 170 m² large stand. It was our 4. Interschutz partition. The fair is as worldwide leading trade fair always a special experience but this year all expectations were exceeded. The Interschutz as worldwide leading trade fair is always a special experience but this year all expectations were exceeded. We had great conversations, got interesting feedback, very good inspirations and answered a lot of questions. Here are some impressions from the exhibition. Since 2016 we have got a third building with a showroom for selecting, trying and choosing. Here you can learn more about lifting bags, stabilization set, ventilation, immobilisation, BA controlling, clothing and much more. Developing from a one-man operation in a local garage to a Europe-wide company has not always been easy, but in 2017 we can proudly look back on 20 successful years. Such a round birthday brings with it that one questions, what will bring the next years? How do we develop further? Where are you travelling to? We have found many answers that are exciting for you too.